Cutting edge patient signout technology saves money, saves time and saves headaches for Inova Hospital. MicroMed Strategy.saw an incredible opportunity to cut Inova Hospitals outdated patient signout process in half. 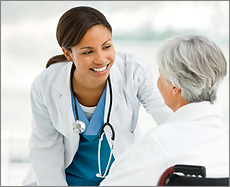 For many hospitals and healthcare organizations, the patient signout process can sometimes be defined as "patchwork" at best. Loose sheets of paper are handed off and handwritten notes are scribbled down. If you're lucky, there's a computer you can use to manage some patient signout tasks. But today's professionals have made it work, one way or another. But at what cost? Just because it's working now doesn't mean there isn't a better way. MicroMed Strategy (through it WebForMDs.com subsidiary) created patient signout system for Inova Hospital that can be accessed anywhere in the building. Just like a brain processing signals from nerve endings, the exchange of patient information happens at one central location, accessible form multiple locations in a hospital. And the entire system is completely HIPAA compliant. TAKE ACTION NOW: Click here to contact MicroMed Strategy for a live demonstration of this technology. Your hospitals medical professionals will never have their workflow "bottlenecked" by the patient signout process again. Save time for saving lives -- not for paperwork. Our Patient Signout technology is an online patient signout system that allows residents to perform patient signout tasks from any computer in the hospital instead of just one or two specific locations. 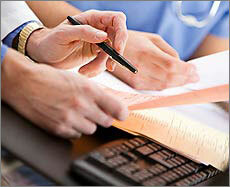 Patient Signout technology saves time, hospital budget, and ensures patient record continuity. Secure patient information can never be intercepted by outside parties. Reduced paper charting yields increased resident and attendings efficiency and productivity.